Dec 11, 2008 (DVB), Former student activist and rebel soldier Htet Aung Kyaw, who now works as a journalist for the Democratic Voice of Burma, launched his book "Far from Home: 20 years in exile" in Chiang Mai yesterday. In his book, Htet Aung Kyaw looks back over the past 20 years of the struggle for democracy in Burma, drawing on personal reminiscences and political analysis. "Far from Home" includes many of Htet Aung Kyaw's articles for DVB, the Irrawaddy, the Bangkok Post and the Nation as well as new material on his experiences with the All Burma Students' Democratic Front. At yesterday's launch, Htet Aung Kyaw spoke about his reasons for publishing the book. "Now we are reaching 20 years of our democracy revolution and I was asking myself why it has taken 20 years already, and how many more it will take," he explained. "Then I asked myself what I have done over these years and I had the idea of publishing a compilation of my articles and writing about my experience in the jungle as an ABSDF member," he said. "I’m publishing this in the hope that it will at least give people something to think about for the struggle." 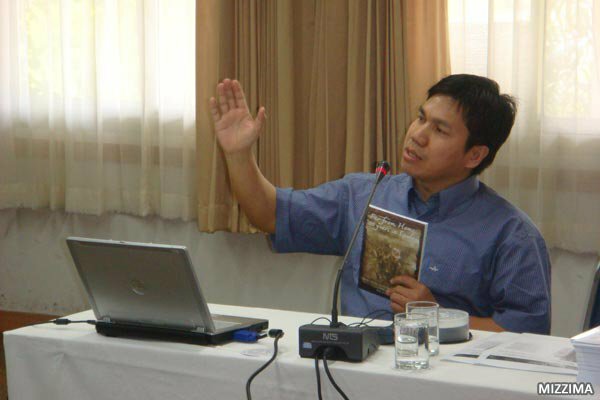 Htet Aung Kyaw said the focus of his writing had changed over the years. "The articles I wrote about 10 years ago for various publications , questioned why a lot of people in the exile movement, especially ABSDF fighters, had started to seek asylum in third countries at that time , had they always planned to do that since they came out of Burma?" he said. "Ten years on from then, today my attention has switched to how far we have come on our journey." BANGKOK, Dec 19 (Asia Media Forum) - On the 20th year anniversary of the 1988 uprising in Burma, a Burmese journalist in exile looks back at how that crucial event influenced his decision to tell the truth about his country. “At the moment, it’s the only thing we can do — tell the truth — through the media,” said Htet Aung Kyaw, a Norway-based journalist and author of‘Far from Home: 20 Years in Exile‘, at the Foreign Correspondents Club of Thailand Dec 17. Htet was an art student in Burma and a local student leader when the Aug 8, 1988 pro-democracy uprising, focused around a call to an end to 26 years of military rule, exploded. Thousands of people, most of them students, were killed in the ensuing crackdown, and many more went into exile into neighbouring Thailand and other countries, making up a good number of today’s exiled community. The series of protests ended on Sep 18, 1988 when the State Law and Order Restoration Council (SLORC), as the junta as called, was established after a military coup. Fleeing to the Karen-controlled rebel area, Htet was recruited into the All Burma Student Democratic Front where he served as commander. A journalist for the past 12 years, Htet could only shrug when asked about the future of Burma. “Everybody is asking why nothing has happened after 20 years. Frankly, I don’t know,” said Htet, adding that change does not happen overnight. In 1989, the SLORC declared martial law to quell further protests and in 1990 held elections, the first time for the country in almost 30 years of military rule. When the National League for Democracy (NLD) party led by opposition leader Aung San Suu Kyi won by a landslide, the SLORC declared the elections void. Since then, Burma has been under the tight grip of the Gen. Than Shwe-led government, now renamed the State Peace and Development Council (SPDC). Nobel Peace Prize laureate Aung San Suu Kyi continues to be under house arrest, along with other opposition figures. Although not much improvement is seen in the political situation, Htet have noted subtle changes happening. “The way people think does seem to have changed. This shift in mentality could be said to be the most significant sign of progress in the past 20 years,” Htet wrote in an article he wrote for the Democratic Voice of Burma website in September this year. In September 2007, the military cracked down on massive protests led by thousands of monks in different cities in Burma. What began as a series of fuel price hike protests became a pro-democracy movement. The protests resulted in at least nine people being killed (independent reports say the figure was much higher), hundreds injured and reportedly thousands of arrests made. One of the major changes, Htet said, is the advent of new media which allowed people to share information faster and to a wider audience. The 2007 protests, for instance, are a prime example of this power given to the people. Through mobile phones and the Internet, particularly via blogs and through the contributions of citizen journalists, the outside world was able to witness the events in Burma. Short-wave radio also helped a lot in the pro-democracy movement’s information campaign, especially via such programmes as Radio Free Asia Burmese and the Democratic Voice of Burma. “The media coverage provided by those in exile is crucial given the current unrest. . . .This time, four short-wave radio stations, a satellite television channel broadcasting to Burma and the Democratic Voice of Burma TV and radio provide non-stop reports from inside Burma,” he wrote for Thailand’s English-language daily ‘The Nation‘ on Oct. 2, 2007. “I think that the Burmese media in exile have contributed a lot in terms of exposing the issues that the government want suppressed. We say this in such events as the 2007 monk-led demonstration and the May 2008 Nargis cyclone,” Htet told AMF. While he does not see the media within Burma being free anytime soon, he believes that there are many good journalists there who share pro-democracy groups’ sentiments. “They just have no chance to voice out their ideas for obvious reasons,” he added. Unfortunately, he said there is a lack of dialogue between ethnic minorities and the NLD. In the past, ethnic minorities complained that the NLD does not have their best interests in mind and would likely to continue the government’s unfair policies towards the ethnic groups, which include the Karen and Shan. When asked about the Association of South-east Asian Nations’ (ASEAN) role in a free Burma, Htet again shook his head. “Although it is playing a more active role now than before, the ASEAN, of which Burma is a member, still has its limitations. I don’t see a way they can change the political situation in Burma anytime soon,” he said. After the September 2007 protests, ASEAN urged the government to stop the violent crackdown against the demonstrators, one of its strongest statements ever against a member country.